Polymer clay handmade earring components. Pair. Heart beads. Transferred image, light weight clay charms. Colorful. Made to Order. Polymer clay handmade earring components. Pair. Transferred image, light weight clay charms. Colorful. Made to Order. Here you can find modern jewelry designs, mostly with a colorful bohemian flair, handmade by me using different materials, like my own polymer clay beads, artisan made beads and gemstones. 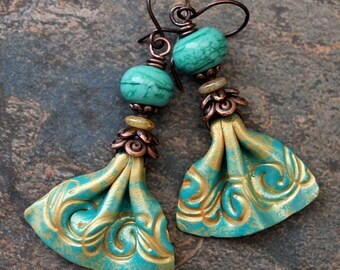 I work with polymer clay and I will be adding new jewelry components too. Polymer clay is a very versatile material to work with that allows me to express myself through colors, abstract motifs and organic patterns, usually inspired by nature and specially made to bring joy and happiness. Please, feel free to contact me if you like a custom work or have any special request. Happy browsing... See my Shop Policies for details on ordering and shipping. Forest. 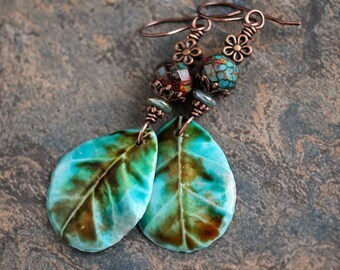 Botanical artisan earrings. Boho style. Leaf earrings. Handmade beads, antiqued solid copper. Woodland Teal green. Very lightweight. Polymer clay Pendant Cabochon. Resin coated Graphic cabs. Transferred image. Bead embroidery cabs. Lightweight. Colorful. Made to Order. Botanical. Boho. Rustic. 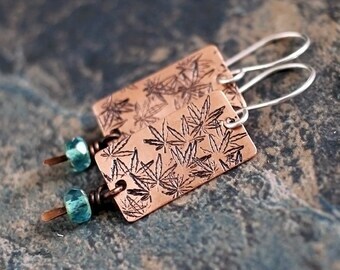 Cannabis artisan earrings. Solid copper, sterling silver and glass. Small dangle earrings. Polymer clay earring components. Pair Earring charms. Christmas themed charms. Transferred image, light weight . Made to Order. Polymer clay earring components. Pair Earring charms. Christmas Snowmen beads. Transferred image, light weight clay charms. Made to Order. Mandala. 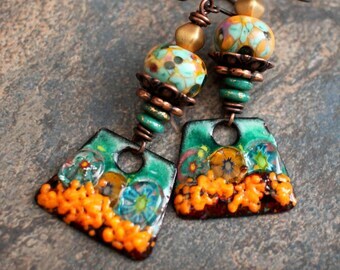 Ceramic and lampwork earrings. 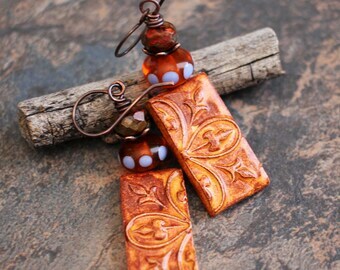 Boho Rustic Artisan earrings. Orange Lavender. Casual, bohemian jewelry. Boho earrings. 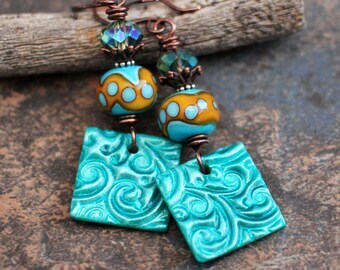 Swirly teal and mustard, clay and lampwork artisan earrings. Boho very lightweight. Bohemian jewelry. Solid copper. 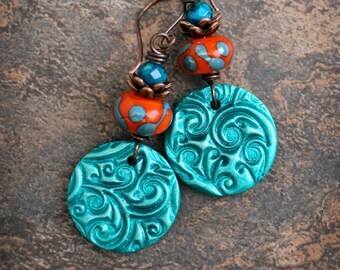 Swirly orange turquoise, clay and lampwork artisan earrings. Boho very lightweight. Bohemian jewelry. Solid copper. Aqua Dragonflies. Ceramic and lampwork earrings. 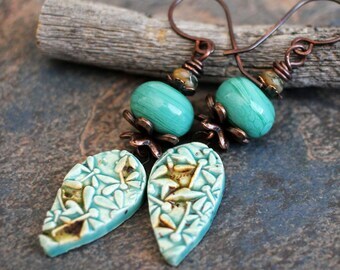 Boho Rustic Artisan earrings. Teal copper. Casual, bohemian jewelry. Boho earrings. Polymer clay earring components. Pair Earring charms. Bird beads. Transferred image, light weight clay charms. Made to Order. Sunflower. Polymer clay earring components. Pair. Earring charms. Bird beads. Transferred image, light weight clay charms. Colorful. Made to Order. Polymer clay earring components. Pair. Earring charms. Butterfly beads. Transferred image light weight clay charms. Colorful. Made to Order. Polymer clay earring components. Pair. Charms. Hummingbird beads. Transferred image, light weight clay charms. Colorful. Made to Order. Wavy skirt, clay and lampwork artisan earrings. Boho very lightweight. Bohemian jewelry. Tapestry inspired. Fabric style clay charms. Tropical Garden. Artisan earrings. Bonemian organic design. Lampwork beads, enameled charms, Czech glass. Solid copper. Green orange. Artisan earring components Polymer clay Transferred image light weight Pair Graphic charms. Made to Order. Flower beads. Floral beads. Polymer clay handmade earring components. Pair. Transferred image, light weight clay charms. Colorful. Made to Order. Flower beads. Floral. Very nice pendants with fun colors! These birds bring me pleasure and thoughts of spring. Adorable little Christmas kittens! These will make great holiday earrings. Color was great....loved these components...great Buyer experience. Love these components. Earrings turned out FABULOUS....!!! Very good Buyer experience....will buy from her again. Earth Expressions, handmade jewelry and components. There is always something new and exciting going on, so be sure to come back anytime and take a look. Owner, Maker, Designer, Curator, Photography, Shipping, Etc. Some considerations you need to know prior to purchasing. Your satisfaction is very important to me. If for any reason you are not happy with your item you may return it within 14 days of purchase for a refund minus shipping charges. All products must be returned securely and unworn with it's original packaging. Please notify me before returning any items, all returns must be authorized. I accept Paypal and most credit and debit cards via Etsy check out. Payment must be within 3 days of purchase, If there are any special circumstances please just let me know and I will do my best to work with you. All items will be shipped within 48 hours after payment is cleared (not including weekends and holidays), unless another specifications in particular listings, very carefully packaged and Tracking Number will be provided for USA addresses. Insurance is not mandatory, but recommended, please send me a note if you require it. THANK YOU SO MUCH FOR YOUR TIME :) HAPPY SHOPPING AND HAVE A GREAT DAY!! !